The Saudi-led coalition resumed early Monday targeting the capital Sana’a and several provinces. The warplanes of the US-backed coalition launched two airstrikes on the military college north of the capital Sana’a, in addition to Nahdeen area south of the capital. The Saudi/UAE warplanes also waged two raids on Dabwa Camp and Al-Sawad Camp in Sana’a outskirts. 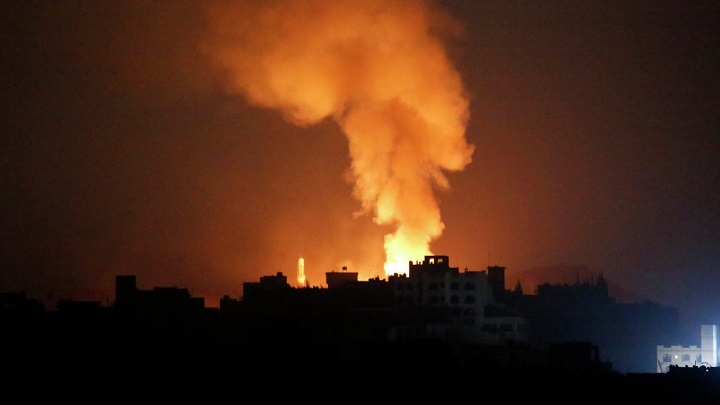 In Al-Hudaydah province, western Yemen, the Saudi-led coalition launched four air raids on Al-Araj region in Bajel district, as well as an air raid on the entrance of Al-Kutaib Resort in Al-Mena district. Heading to Bayda Province, the warplanes waged three airstrikes on Nadha region. Concluding it with the capital Sana’a, at least six consecutive air raids had struck Sana’a International Airport and Al-Dailami Base, after midnight on Friday/Saturday.